Like much modernist writing, Beckett's work has often been read as an experiment in consciousness. Explorations of the shape of the relationship between subjectivity, language and the body remain a mainstay of much Beckett criticism, while the more popular cultural sense of Beckett is still resolutely convinced of the work's probing of the human condition. More recently, archival support for Beckett's knowledge and use of neurological, psychological and psychoanalytic material, allied with an increasingly dominant cultural sense of the mind as a complex epiphenomenon of an evolved neurological substrate, has produced critical studies exploring the suggestive resemblances between Beckett's textual experiments and those neuropsychological and psychiatric disorders that illuminate the modes of functioning of the human brain. What has been less fully explored, however, are the methodological implications of reading Beckett's work alongside historical and contemporary neurology and psychology. What are the critical and ethical problems inherent in relying on a mode of 'resemblance' between Beckett's work and brain science? What new kinds of critical practice might be forged between disciplines? Might Beckett's work might have clinical as well as critical uses? 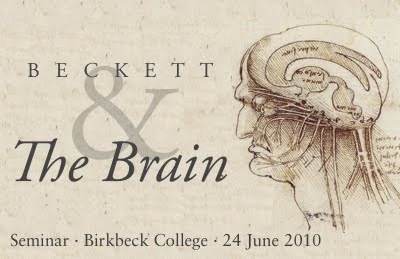 The London Beckett Seminar is hosting a morning of 'position papers' and discussion on the topic of 'Beckett and the Brain' to explore some of these questions. Room 203, Birkbeck, Clore Management Centre, Torrington Square.